(ISJM) The Lo Tishkach (Hebrew: ‘do not forget’) Foundation European Jewish Cemeteries Initiative was founded in 2006 as a joint project of the Conference of European Rabbis (CER) and the Conference on Jewish Material Claims Against Germany. The Foundation's goal is to guarantee the effective and lasting preservation and protection of Jewish cemeteries and mass graves throughout the European continent. This is hardly the first such effort, but it may be the best organized to date, though according to Executive Director Philip Carmel, the Foundation works on a tight budget, and is dependent on a small staff and the efforts of many volunteers. One of the biggest challenges since 2006 has been to gain the trust of and forge partnerships with the many local regional and countrywide organizations that have already invested heavily in time, labor and funds in the documentation of Jewish cemeteries and in some cases, organizing their protection and preservation. Carmel notes that this is not a competitive effort but a cooperative one. The number of Jewish cemeteries in Europe remains unknown, but with 8,593 already listed in Lo Tishkach's database, it seems certain that more than 10,000 sites will eventually be identified. Just listing the cemeteries and trying to gain some little information about them is a difficult job, and keeping track of even a part of these is an almost impossible task. There is room for everyone's participation. I should know, since I've probably been as involved in this work over the past twenty years as anyone. Through my work with the World Monuments Fund, and then as Research Director of the US Commission for the Preservation of America's Heritage Abroad, I've helped organize countrywide inventories and site surveys of Jewish cemeteries in a dozen countries. I'm delighted that there will now be a central place where this information and more up-to-date reports can be processed, stored and made public. More importantly, since Lo Tishkach is affiliated with the Conference of European Rabbis, there is hope for establishing some consistent standards for documentation and conservation. Now, efforts are often haphazard, and so-called conservation and preservation measures are often destructive rather than protective. Still, whether Lo Tishkach will become an umbrella organization or part of a network remains to be seen. I think if the project can stay funded and active for a few more years, it will earn its position and the respect and appreciation of other organization,s institutions and the hundreds of Jewish communities across Europe. ISJM has agreed to make its files and lists of cemeteries available to Lo Tishkach for use. Based in Brussels, Lo Tishkach received its official royal decree formally establishing the organization as a Foundation of Public Utility under Belgian law (no. 899.211.180) in June 2008. The foundation has set itself two important start-up goals. First, is the creation of a comprehensive publicly-accessible database featuring up to date information on all Jewish burial grounds in Europe. This work obviously builds on previous inventories compiled by the Commission and its partners, and by local Jewish communities and monuments authorities. It is doubtful that any country has a complete list of all Jewish cemeteries, since over time, especially in Western Europe, most pre-modern cemeteries have been lost to memory. In Central and Eastern Europe and in the Balkans the destruction of the Holocaust and the policies of Communism have wiped out traces of hundreds of cemeteries, and added to these are the (often unknown) sites of mass graves. The second goal is the compilation of a compendium of the different national and international laws and practices affecting these sites, to be used as a starting point to advocate for the better protection and preservation of Europe’s Jewish heritage. This is a policy begun by the Commission in the early 1990s (see the reports I edited with Phyllis Myers on Poland and the Czech Republic). But laws change, and in many countries there are many different types of laws that affect burial sites. These include cultural heritage laws, land use laws, religious practice laws, human rights policies, etc. Lo Tishkach is systematically attempting to identify all laws in effect for each country and to post these. Gradually, they are being analysis to see their affect upon cemetery protection and preservation. In many cases laws need to be changed - but governments many government have been loathe to do so. Some of these laws are already posted on the Lo Tishkach website. Some reports are not yet posted, but are available from the Foundation. Legislation has currently been obtained for some 15 of the 48 countries in the remit of the project (see the Compendium of Legislation for more details). According to the Lo Tishkach website: "A third aim of the project is to engage young Europeans in this process, bringing Europe’s history alive, giving a valuable insight into Jewish culture and mobilising young people of all faiths to care for our common heritage. Groups trained by Lo Tishkach will visit Jewish burial sites across Europe, beginning in Poland and Ukraine, gathering vital information on Jewish life and culture in each area and submitting cemetery condition reports that will be used as the basis for actions to preserve and protect these important sites." The Lo Tishkach European Jewish Cemeteries Initiative founding partners are: The Conference of European Rabbis federates Jewish religious leaders in over 40 European countries and includes all the continent’s chief rabbis and senior rabbinical judges. The CER holds consultancy status as an international non-governmental organisation at the Council of Europe and within the institutions of the European Union. The Conference on Jewish Material Claims Against Germany works to secure compensation and restitution for survivors of the Holocaust and heirs of victims. Since 1951, the Claims Conference – working in partnership with the State of Israel – has negotiated for and distributed payments from Germany, Austria, other governments, and certain industry; recovered unclaimed German Jewish property; and funded programs to assist the neediest Jewish victims of Nazism. The Foundation is looking for assistance with the collection of any legislation which does not currently feature in the Compendium, and particularly for those countries for which legislation has not been found. As a guide, appropriate legislation may include that dealing with the protection of monuments, burial sites or war graves. The Foundation aims to collate all appropriate legislation in both English and the original language, we would also greatly appreciate any voluntary assistance with translation from anyone fluent in an Eastern or Central European language and English. For further information please e-mail volunteering@lo-tishkach.org or telephone +32 (0) 2 649 11 08. The foundation also invites volunteers to use the website to fill out forms about visited cemeteries. If you have recently visited a Jewish cemetery anywhere in Europe, or plan to make a visit in the future you can send a Cemetery Update. This inclusive practice is adapted from the policy of the Association of Jewish Genealogical Societies, but with the intent of greater scrutiny for consistency and accuracy. If you are interested in volunteering as a Cemetery Condition Officer and submitting reports for a number of cemeteries in your area, please contact volunteering@lo-tishkach.org or telephone +32 (0) 2 649 11 08. No single topic has more dominated art by Jews and so-called Jewish art since the 1960s than the Holocaust. Even today, when new themes have begun to surface among Jewish artists; Holocaust images, interpretations, and meditations appear frequently - and increasingly commonplace. At any give time there are at least several - and often dozens - of exhibitions of Holocaust-era art,Holocaust-inspired art, or art the in some ways references to Holocaust. An upcoming symposium at San Francisco's California College of Art will address the topic of "The Holocaust Effect in Contemporary Art." The effect of the Holocaust on the literature of late 20th-early 21st century has been well documented. Its effect on visual representation and the art of the second and third generations only has come to attention more recently. The panel discussion brings together three Bay Area artists all CCA graduates whose recent projects have been infused with the theme of the Holocaust, an art historian and a curator in an attempt to define the new visual parameters of the Holocaust effect. The symposium is co-sponsored by the California College of the Arts and co-presented by the Holocaust Center of Northern California. For more information, please contact Allison Green at agreen@magnes.org or 510.549.6950 ext. 337. The controversy in Spain over the excavation of medieval Jewish cemeteries and the removal of the bones is a serious matter - and one that needs to be addressed. But while some action may set precedents, we can also expect no universal agreement over what actions should be taken, and disagreements are likely to be found within the Jewish community, too. This is nothing new, and it should not be assumed that all Jews have always disapproved of the removal of Jewish bones. We know that in antiquity is was common to gather bones and place them in ossuaries, though scholars disagree on how widespread was this practice, and for how long it was maintained. In recent years, some Jewish communities in Central and Eastern Europe have been accused of selling off parts of cemeteries for income to maintain other (social and religious) programs. In my research on 19th-century American synagogues, I came across an 1880s dispute within the congregation of Temple Beth El, which had been joined by Congregation Anchi Chesed in 1873. Two years later a move to sell the now-valuable Manhattan cemetery of Anchi Chesed led to a legal challenge within the newly expanded congregation. The dispute was chronicled in the pages of the New York Times. I am preparing a paper about these and other Jewish cemeteires in Manhattan, in which I hope to be able to tell the full story of the Anchi Chesed - Beth El dispute. A meeting of about twenty members of the Congregation Anchi Chesed was held yesterday morning at the Teutonia Assembly Rooms, to protest against the threatened disinterment of the bodies in the cemeteries in Forty-fifth street and Sixth avenue, and Eighty-ninth street, near Madison avenue. Last week the Congregation of Beth El issued a notice that the Trustees had obtained a permit form the Board of Health for the removal of the bodies to the Union Field Cemetery [a newer cemetery on Long Island]. The members of the Congregation Anchi Chesed are opposed to the measure on the ground that it is contrary to their faith to disturb the bones of the dead, and complain that the only motive of the Congregation Beth-El is to dispose of the land to the highest bidder. The claim of the Congregation Beth-El to the ground is founded in its consolidation with the Anchi Chesed two years ago, when a magnificent temple, costing $250,000 was built for the joint membership. It is now sought to pay off a heavy debt on this structure by the proceeds of the sale of the graveyards. This will be contested by the old members of the Congregation Anchi Chesed, who claim the deeds for the lots stand in their names, and that the other society have no right whatever to them. The grounds are valued at from sixty to eighty thousand dollars. The meeting yesterday was presided over by Mr. Heiman, who stated its object and spoke, in indignant terms of the proposed desecration of the graves of their relatives and friends. After remarks of a like tenor by others, a committee of three was appointed to engage counsel and take other steps to frustrate the plans of the Congregation Beth-El. The meeting was then adjourned until Wednesday evening, to meet at No. 98 Avenue C.
The Trustees of the Temple Beth-El, Sixty-third-street and Lexington Avenue, recently adopted a resolution to the effect that the remains of the persons now buried in the cemetery at Eighty-ninth-street near Madison avenue, should be disinterred on and after March 8, 1880, and removed to the new Union Fields Cemetery of the congregation, there to be reinterred in an appropriate manner. The old cemetery in Eighty-ninth-street occupies a plot about 100 feet long by 50 feet wide near Madison-avenue, and contains 53 graves with head-stones and a number of others unmarked. The cemetery has not been used for the past 25 years, is overgrown with grass and weeds, and bears a generally neglected appearance. It was originally opened in 1839 by the congregation Anchi Chesed, which in 1852-3 [??] became the Temple Beth-El. The new burial grounds to which the bodies from the old cemetery will be transferred are pleasantly located near the Brooklyn Water-works. D. Kohns, Secretary of the congregation, stated to a TIMES reporter yesterday that the removal of the bodies would be made as expeditiously as possible. Relatives of the deceased who prefer reinterment to be made in their own cemetery plots are expected to give notice of the fact to the Secretary. In case the relatives cannot be ascertained or are too poor to meet the necessary expense of reinterment in a a separate plot, the congregation will provide for them. Mr. Kohns said that the old Eighty-ninth street cemetery has been used only about 15 years, from 1839 to 1855, and that there was consequently very little history connected with it. There will be no ceremonies attending the reinterment. (ISJM) The Museum of History of Barcelona will host the two-day conference "Archaeological Intervention on Historical Necropolises: Jewish Cemeteries" on January 15th and 16th, 2009. This is a timely topic, given the current controversy about the medieval Jewish cemetery at Toledo. The mission of the museum "is the reassessment of the historic heritage of Barcelona, whether the items are movable or immovable. In other words, the museum is responsible for the conservation, research, and dissemination of the objects and buildings that are significant for our collective history and that exemplify the city's past... the best city museum is the city itself, and that it is in its streets, squares, and buildings where we can interpret the passage of time and the interaction of the men and women that have made, throughout the centuries, today's Barcelona possible"
The artistic, historical and cultural heritage forms an asset which, following its institutional recognition and classification, is safeguarded by the public administrations. This heritage, formed by elements and ensembles which the successive historical legacies have left in a territory,consists of very different types of cultural goods in which the respective collectives as a whole recognise themselves. In the case of the medieval Jewish legacy, Barcelona has recently opened the Barcelona Jewish Quarter Information Centre and the city also possesses an important Jewish necropolis on Montjuic hill. These are historical expressions of a period in the city's past when the Jewish community played a highly significant role. The need for forums in Catalonia and throughout the rest of Spain for discussion of issues related to the documentation, protection, preservation and presentation of Jewish heritage is great, therefore the scheduling of this conference in Barcelona is important. I fear, however, that the views expressed by the invited experts may not reflect a representative sample of opinion. The very wording of the statement of purpose of the seminar, which sets out to examine the question of the Barcelona Jewish cemetery from a "legal and scientific" standpoints suggests that others approaches - religious, ethical, moral, historical and cultural - may get short shrift. I hope not. These approaches need to be considered as part of archaeology, too. The seminar features presentations from distinguished speakers - many of whom I admire greatly. From the program, however, it appears that the bulk of presentations are by archaeologists - some of whom are on record as being dissatisfied with resolutions where human remains from medieval cemeteries have been re-interred, or those in the field of heritage site management. There is no presentation of Jewish law or tradition from a scholar or authority on Jewish burial practices to provide appropriate balance. There is participation of one representative from the Federation of Jewish Communities of Spain on the round table "Models and protocols of intervention on medieval cemeteries in Catalonia." Given that the Federation recently signed a protocol (since rejected) which would have allowed the essentially unhindered excavation of cemeteries in favor of development projects, this particular representation does necessarily speak to the protection of cemetery sites. Without the discussion of the religious factors and inclusion of religious viewpoints as part of the discussion, any solutions proposed from the seminar are bound to be questioned and are likely to fail. Including all sides in the discussion is, of course, a messy business. But so is digging up cemeteries. The seminar organizers seem to accept a priori that the Jewish cemetery in Barcelona (and by association, all other such cemeteries in the region) is first and foremost an archaeological site and can and should be considered as part of the archaeological heritage of the region. Even the seminar speakers who I can recognize as being Jewish come from mostly an archaeological background, or are professionally engaged in the presentation of archaeological sites. I would put forward the claim the Montjuic is not an archaeological site - but a religious, historical, cultural and urban site - both sacred and communal - and therefore needs to be considered under a different set of assumptions, standards and expectations than archaeological sites. True, many archaeological techniques of survey, mapping, testing, conservation and interpretation can be applied at Montjuic, without excavation of the human remains. This is the type of "scientific" work that should be proposed and pursued. I hope that the conference will be recorded and/or transcribed. The presentation will certainly be important contribution to the continuing discussions on how to interpret and preserve the medieval Jewish heritage in Spain. On the situation in Toledo see my lengthy post of a few days ago -- I was holding it waiting for confirmation on a few points. Here is more news from Ruth Ellen Gruber's blog and the JTA. On December 18, 2008, a memorial plaque commemorating the site of the destroyed synagogue was unveiled on a building located at 4 Stycznia St. in Barcin (kujawsko-pomorskie province). The ceremony was organized by the Foundation for the Preservation of Jewish Heritage in Poland. The simple text on the plaque reads "Synagoga w latach 1837 -1939," and in Hebrew "Beth Kenesset." Click here for photos of the plaque and ceremony. Last year (November 2007), a memorial tablet commemorating the local Jewish community was unveiled at the Jewish cemetery in Barcin. The ceremony was co-organized by the Foundation for the Preservation of Jewish Heritage in Poland. It is always an important step when the site of a synagogue or cemetery is commemorated, and more systematic effort still needs to be done in Poland and elsewhere. As is well known, my own preference is also for signage that is both commemorative and didactic. It is mistake to assume that every one knows that fate of a synagogue and community just be view seeing the date 1939. Some narrative text should be included, as well as a picture of the destroyed site when possible. New signage materials now make this fairly easy. The Judah L. Magnes Museum, home of one of America's most acclaimed collections of Judaica is moving to downtown Berkeley (California) where it hopes to attract more attention, visitors and to redefine its position in the high-stakes and increasingly competitive world of Jewish museums and cultural centers. The Museum's plans to adaptively reuse the former Armstrong University Building at 2222 Harold Way, a designated local landmark designed by Walter Ratcliff, Jr., were approved by the Berkeley Landmarks Preservation Commission in July, 2008. The new design is by San Francisco architects Mark Cavagnero Associates. Extensive plans and elevations of the new facility can be viewed online. The Magnes Museum, founded in 1964, seeks to raise $18 million to convert an historic building in downtown Berkeley. Museum officials say they are far into the campaign. As with so many Jewish cultural institutions, it remains uncertain how the recent turmoil in the financial sector will delay its achieving its stated goal. Plans still call for a start to construction next summer for the new, 35,000-square-foot museum with the opening planned for 2011. The Magnes Museum also holds the largest single historical collection related to Jews in the West as part of the Western Jewish History Center, founded in 1967. The Center collects reference books and periodicals; personal and family documents; institutional archives; art and artifacts. Highlights include one thousand reference volumes; sixty Jewish newspaper titles; thousands of photographs; dozens of paintings and works on paper; and fifty oral histories. The rhetoric and protests over the excavation of the medieval Jewish cemetery in Toledo, Spain have heated up since I last wrote about this in early November. There have been some recent developments that give hope for a solution. Specifically, the Spanish government has ordered a stop on all work at the site until at least January 15, 2009. A complete halt to work was a condition of Jewish religious groups to their joining in negotiation. The Conference of European Rabbis (CER) in a press release (below) praise the government's action as "positive decision." The halt follows weeks of public demonstrations outside of Spanish embassies, protests form abroad to the Spanish government and intensive discussions by representatives of the Federation of Jewish Communities of Spain, the CER, and the Committee for the Preservation of Jewish Cemeteries in Europe (CPJCE). These discussions followed the signing by the president of the Spanish Jewish Federation in late November of a protocol with the Spanish government that would allow Jewish cemeteries when found to be excavated, but to have the bones collected and removed elsewhere. The agreement was widely denounced - since it opens the doors for unlimited development of cemetery sites. It also violates the most basic regard for the religious sanctity of cemeteries - a critical belief of observant Jews; and also their historic and cultural importance, a value cherished by cultural traditionalists and historians, and historic preservationists. Archaeologists were dissatisfied, too, since it allowed excavation but not the prolonged analysis of human remains essential to the field of paleopathology, physical anthropology and related branches of archaeology. As a result, the Rabbinical Council of Spain sent a letter to the government clearly requesting the legal protection of Jewish cemeteries. To my mind, this should have been the first and only position advocated, and it is the only acceptable solution. Only by beginning with a blanket protection of cemeteries can extraordinary circumstances and situation be recognized and when necessary negotiated and resolved. It is important that the destruction of cemeteries and the exhumation of remains always be the absolute last solution. Prayer vigils (demonstrations) organized by The Central Rabbinical Council (CRC) of the United States and Canada in front of the Spanish Consulate in New York, and other demonstrations organized by Atra Kadisha - the most active of all groups in monitoring archaeological work in Israel (and increasingly in Europe, too) - at the Spanish Embassy in Tel Aviv raised the public profile of the conflict. Rabbi Isaac Gluck, executive director of The Central Rabbinical Council (CRC) of the United States and Canada wrote a strong public letter in which he compared the removal of the dead from the cemetery to the brutal expulsion of Jews from Spain in 1492. In his letter to the Spanish Ambassador in Washington Rabbi Gluck wrote that "we hope that you would enhance your tourism among Jews by protecting Jewish cemeteries as revered remnants of a Golden Age - not threatened tourism with acts of brutality, which remind Spanish citizens, and Jews alike of the acts, which even now cause pain and anguish in their recollection." The public protests follow a previously successful media-savvy method of putting pressure on recalcitrant governments (Germany, Poland, Czech Republic). Significantly, it is the Spanish Foreign Ministry, that has taken the lead on calling for a halt to the excavations, not the municipality nor any department of internal affairs. The Barcelona-based cultural heritage group ZACHOR has called for the landmark designation of the Toledo cemetery site - something that can easily be done according to existing Spanish cultural heritage law. In the case of Toledo, archaeologists seem to be keeping quiet ,and they are surely caught in the middle. The cemetery excavation was neither advocated nor planned by archaeologists - they were instead performing common archaeological rescue work, making the best of a bad situation when a sanctioned development project encroaches on historical remains. It is the local government which presumably gave the permit for this work that is mostly at fault, since the approximate location of the cemetery has been long known to local historians. Archaeologists have apparently tried to treat the site with care, with the hope of extracting all information about its history as possible in these circumstances. I still have not heard what, if any, comment or protest the staff of Toledo's well-known Museo Sefardi have made about the cemetery excavation. Certainly, as the locally recognized authorities on Jewish culture in Toledo they should have been vigilant in identifying and protecting historic Jewish sites. 1. In Toledo, restoration of the cemetery site. Burials should remain in situ and be recovered, removed bones should be returned. The school will have to find another solution for its expansion. The Jewish community, the Museo Sefardi and others should use this as an opportunity to develop education and la cultural programming about Jewish history in the area. If all the bones have alreacdy been removed, the solution used in York, England may be neccessary - the creation of a new place at the site for re-burial of remains. 2. Nationwide, all pre-modern Jewish cemeteries should be immediately added to the national list of protected historic sites and they should be properly marked so none can claim ignorance of their existence. 3. Since the exact location of only a few medieval Jewish cemeteries is known, an intensive multi-year research effort needs to be undertaken to identify with as much exactitude as possible the actual and likely locations of Jewish cemeteries. Scholars in archives and archaeologists using various regional and site survey methods can move this project forward. ZAKHOR has already presented a proposal (for which it seeks funding) to begin this process. Together with a list of distinguished scholars, I have agreed to advise and possibly participate in such a project. I'll be writing more about this, and related issues of medieval Jewish remnants and remain in Europe in future blog posts. London, December 22 - The Conference of European Rabbis (CER) and the Committee for the Preservation of Jewish Cemeteries in Europe (CPJCE) welcome the decision of the government of the Kingdom of Spain to cease all works at the medieval Jewish cemetery in Toledo. The decision taken Friday, December 19, follows high-level meetings at the Spanish foreign ministry in Madrid with representatives of the Federation of Jewish Communities in Spain, the Conference of Spanish Rabbis, the Conference of European Rabbis (CER) and the Committee for the Preservation of Jewish Cemeteries in Europe (CPJCE). The CER and CPJCE welcome this positive decision on the part of the Spanish government and urge the government to verify that its decision is fully adhered to on the ground by the local authorities in Castilla-La Mancha. At its meeting on December 18 in Madrid with Ambassador Ana Salomon of the Spanish Ministry of Foreign Affairs and Cooperation, CPJCE Executive Director Rabbi Avraham Ginsburg and CER International Relations Director Philip Carmel had demanded that work cease immediately at the Toledo cemetery. Such a halt is deemed urgent by senior European rabbinical authorities in order that an adequate solution can be found for the graves. Talks are continuing with the authorities in Madrid and Toledo to find a comprehensive solution to this issue in the coming days. The CER and CPJCE demand that all further actions by the authorities in Toledo and by the Spanish government concerning the Jewish cemetery in Toledo and all Jewish cemeteries in Spain be coordinated with the full approval of the Conference of Spanish Rabbis headed by the Chief Rabbi of Madrid, Rabbi Moshe Bendahan, and with the CER and CPJCE. The Conference of European Rabbis federates Jewish religious leaders in over 40 European countries and includes all the continent's chief rabbis and senior rabbinical judges. The CER holds consultancy status as an international non-governmental organisation at the Council of Europe and within the institutions of the European Union. I've been writing about presidents and synagogues, so it is appropriate that this note just came in from the JTA about Polish president Lech Kaczynski visiting the Nozyk Synagogue in Warsaw. I'm actually surprised that he is the first Polish president to do so. Meanwhile, the synagogue is getting a facelift - stone, brick, plaster on the exterior are being entirely restored. I've gotten conflicting accounts about who is paying for this - whether it is the Jewish Community of Warsaw or the City of Warsaw. Most likely, it is a combination; the project being by the Community with a grant from the City since the synagogue is a designated and protected historic site. Write in if you have more information. PRAGUE (JTA) -- A president of Poland visited a synagogue for the first time since World War II, Polish Radio reported. President Lech Kaczynski and his wife visited the Nozyk synagogue in Warsaw on Sunday. The president, the first sitting Polish president to visit a synagogue in more than 60 years, lit the first candle for Chanukah in a silver menorah. During the service, the congregation recited a prayer for the 90th anniversary of Poland's independence. The prayer was written by the rabbi of Krakow, Boaz Pash, according to Polish Radio. He was joined in its recitation by the chief rabbi of Poland, Michael Schudrich. Ruth Ellen Gruber writes about cuts in government funding in Italy and how they will impact Jewish heritage projects - especially synagogue restoration for which local, regional and national government often contribute from 50% to 70% depending on the circumstances. The renegotiation of the Vatican Concordat in 1984 established Italy as a religiously pluralistic nation. Unlike the United States which separate religion and government and therefore denies most kinds of support to historic churches and synagogues, in Italy the new situation only served to equalize a system where previously Catholic churches benefited from public funds, but not other religious institutions. Thus, the state was suddenly responsible for the protection of a while realm of Jewish heritage sites it had previously ignored. This change has led, over the past quarter century to a revolution in the treatment and promotion of Italian Jewish sites. Synagogues which ad previously been closed and often dismantled, were now treated to ambitious, expensive and high quality restoration. Private funds have been raised locally and internationally to match government support. At the same time, new guidebooks, museums and tour companies have developed to promote this cultural legacy. So much good work has laready been accomplished, it seems doubtful that the present economic crisis will cause great harm. Some projects might be slowed, but many of the very best sites in the Veneto, Piedmont, the Marche and Tuscany have already been restotred. A Jewish member of the Italian Parliament, Alessandro Ruben, says that the state funding cuts for Jewish heritage forced by the economic crisis may not be as disastrous as earlier predicted. About 25 percent of the funds allocated in the 2009 budget for restoration and repair of Jewish cultural heritage (amounting to €450,000) are being cut. Moked.it, the online newsletter of the Union of Italian Jewish Communities (UCEI), reports that an order has been issued sanctioning the government to provide extra resources "in particularly urgent cases." "In particular situations the Ministry of Culture will evaluate, at the request of the UCEI, the possibility of allocating further funding," Ruben said. "The ball is now in the UCEI's court," writes Daniela Gross on the Moked web site. "It will be up to the [UCEI's cultural heritage] commission to carry out the difficult task of evaluating the numerous requests from individual Italian Jewish communities to restore and recuperate Jewish heritage and to establish priorities, deciding which need to be handled right away and which can be put on hold." I am happy to post the following to announce a showing of Christian Binder's Romania Synagogue photos in New York next month. Contributors who would like to see this work continued should contact me. ISJM has put together a proposal to allow Christian and Julie to keep working on this project...modest funding is needed. Photo-Documentary Exhibition: "Synagogues of Southern Transylvania"
In the wake of the Holocaust and subsequent mass migration of the vast majority of Romania's Jewish population, countless synagogues fell into various stages of disrepair and decay. This photo exhibition aims to capture the transitional stage in which Romania now finds itself. With the entrance of foreign investors and NGOs, some synagogues are being restored, turned into cultural centers or finding alternative uses. Others remain abandoned, assuming a central location in the town's center and representing an evocative, stubborn reminder of the recent and troubled past. The questions are numerous - what will become of these buildings now that they can be used again? Will their respective towns take responsibility for their upkeep? How can they be integrated into a long-term plan for urban or rural renewal? And how can the countless still decrepit synagogues, many of significant historical or architectural value, be incorporated into a systematic and far-reaching plan to commemorate and celebrate a culture which used to play a considerable role in Romania's vibrant multi-cultural existence? Reader Diana Muir has sent me a link to the Wisconsin Small Jewish Community Project established in 2001 by the Wisconsin Society for Jewish Learning to "research, preserve, and educate the Jewish and general public about the history of Wisconsin Jewish communities" You can find on the website a database with information about Jewish communities (past and present) throughout Wisconsin, an read a history of Wisconsin's Jews. There is mention of several synagogues, though not yet much information on the history of the planning, design and architecture of the structures, or of their subsequent histories. 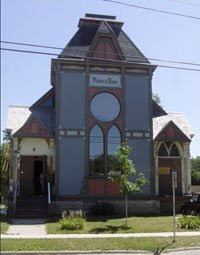 A few current restoration projects are mentioned, such as that of the former Temple Zion in Appleton (shown above) which was begin restored in 2005 by the owner, WahlOrgan builders. Temple Zion, 320 N. Durkee was the synagogue of Appleton's German Jewish - and ultimately Reform Jewish - community. It opened in 1883 with a small school building next door, and the synagogue served the community through the 1920s. The building is reported to be undergoing restored (presumably now finished?) to its original condition and colors. Appleton had a thriving Jewish community in the 19th century. Harry Houdini (1874-1926) was the son of the community's first rabbi, Hungarian-born Mayer Samuel Weiss. The Houdinis lived in Appleton from 1874 until 1883, when the rabbi was fired because he couldn't preach in English. Houdini, born Ehrich Weiss in Budapest, often claimed Appleton as his birthplace. Novelist and playwright Edna Ferber (1885-1968) came at age 12 to Appleton with her family. Her father owned the My Store general store. Ferber began her writing career as a teenage newspaper reporter at the Appleton Crescent (Her 1904 interview with a visiting Houdini is posted on the web site http://www.apl.org. During a stint at the Milwaukee Journal, Ferber collapsed from exhaustion. She returned to Appleton and wrote her first short story and first novel. She won the Pulitzer Prize in 1924 for the novel "So Big." Her 1939 autobiography "My Peculiar Treasure" recalls Appleton's prominent German Jewish community and her experiences in the choir of Temple Zion. I can not find the town or synagogue of Stevens Point on the database, however. Readers of the ISJM E-Report may remember my notices of the restoration of that synagogue as a museum last June (just before I started this blog). You can read about it here. On election day I wrote about presidents and synagogues, but at the time I didn't realize that then candidate and now president-elect lives in a former Jewish Day School, and lives immediately across the street from one of my favorite synagogues, Temple Isaiah - K.A.M. in Chicago, the quintessential Byzantine Revival synagogue designed by Chicago Jewish architect Alfred Alschuler in 1924. 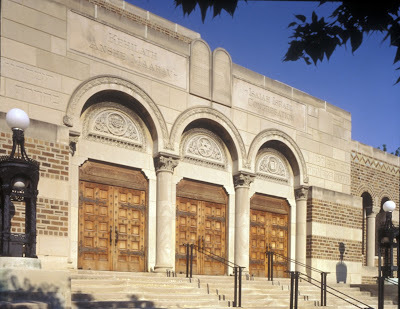 I featured this synagogue in my 2003 book (American Synagogues: A Century of Architecture and Jewish Community), but I never realized when I stood facing and photographing the facade that I had my back to the Obama home. I'm thinking that since the synagogue has a chimney disguised as a minaret, maybe that's where the story of Barack being a Muslim started. But its not the Muslim call to prayer one hears on Greenwood Ave., and certainly now not "Barack Who?," but rather the Baruch hu. Charles B. Bernstein and Stuart L. Cohen have researched the history of the Hyde Park house which could become the Chicago White House (unless they sell when they move to DC, as many speculate they will), and presented their findings in the Chicago Jewish News. They write that " Indeed, the title history of the Obama house shows it has a rich Jewish history, one that encompasses both of Chicago's rival communities, the Reform Hyde Park German Jews and the Orthodox West Side Russian Jews." The house was built around 1908, and was bought by the Hungary-born Max Goldstine, its first Jewish owner in 1919. By the 1940s, a small but active group of Orthodox Jews were living in Hyde Park in 1947 they established the Hebrew Theological College (a yeshiva) in the former Goldstine House. In the late 1940s, the house was also the home of the South Side Jewish Day School. When Hyde Park's Orthodox population dwindled, the Yeshiva sold the property to the Hyde Park Lutheran Church in 1954. "It is a beauty and a joy, surrounded by a spacious lawn, trees and a dwelling house environment. Its low, flat dome and horizontal lines are delightfully accentuated by the tall slender chimney, reminiscent of a minaret from which the faint, intoned voice of the musessin would complete the picture of beauty. It is one of those structures that we return to, always eager to get our feel of its beauty of form and color." Others found the mosque analogy puzzling, and even offensive. But preoccupation with the mosque detracts from the real elegance Alschuler’s geometric solution – an octagonal space surmounted by a high dome supported on vaults that spring from eight massive free standing piers. There is a semicircular balcony included to increase seating in close proximity to the bimah and Ark. The supporting piers are close to the walls to keep the sanctuary space uncluttered. The dome was made of Guastavino tile, like that of Rodeph Shalom in Pittsburgh. The tile was both structural, but also covered wall areas to improve acoustics. The use of Guastavino tiles allows other attractive details, such as the sinuous stairs the twist up to the balcony from either side of the vestibule. Overall, the building maintains two levels of decoration. The first derives solely from the careful mix of materials and combination of soft earthy colors in the tile and brick. The seconds is an extensive overlay of explicit Jewish symbols, which crescendo as one progresses through the building. The stylized Decalogue is set over the main entrance, and a more traditional Decalogue sits within the arch above the Ark, designed as a large Syrian arch – a motif known from Byzantine Palestine. In the ornate vestibule there are Emblems of the Twelve Tribes of Israel. The Star of David of prominently depicted in inlaid brick in each of the four great pendentives of the interior vault and in a large roundel at the apex of the dome. The six-pointed star also stands out in a roundel at the apex of the architectural composition of the Ark wall. Stars are embedded throughout the building, including on the impost blocks set above ornate capitals in the Byzantine manner. Large freestanding menorahs flank the Ark. Perhaps the most remarkable decorative element in Temple Isaiah is not architectural. It is a large figurative stained glass window representing Moses. This tall image of the Prophet holding the tablets of the law is set in the balcony level, and is not easily visible form the sanctuary below. The depiction of figures, even of Moses, was still unusual in synagogue art, but by the 1920s not entirely uncommon in Reform Temple. 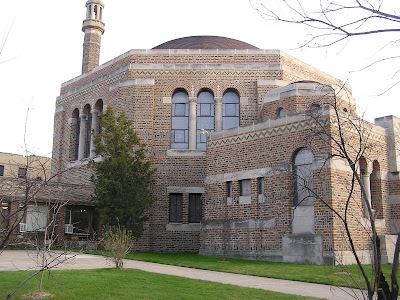 For those visitors to the Chicago’s south Side who cannot pass the congregation KAM – Isaiah Israel security cordon, there are still other opportunities to visit historic and architectural distinctive synagogues. I’ll be writing about two of these soon – one designed by Dankmar Adler and the other by Alschuler. Both are now churches, and are well-maintained and welcoming to visitors. Judaica: Kestenbaum & Company Judaica Auction in NYC December 18th. Kestenbaum & Company will conduct a sale of Fine Judaica on Thursday, December 18th at 3:00 pm. at the company's headquarters at 12 West 27th Street in New York City. Among the numerous books on offer in the 360 lot sale are Selections from the Rare Book-Room of a College Library (Part II), Bibles, Chassidic & Kabbalistic Books, Passover Hagadahs, Liturgical Books and Books relating to the Holocaust. A novel section of rare Jewish Cookbooks is sure to garner interest. Also featured in the auction are Illustrated Books by Ze'ev Raban, Issachar Ber Ryback, Hermann Struck, Arthur Szyk and other 20th century Jewish artists. The catalogue can also be ordered. A form is available on the website. The Kestenbaum catalogues are very useful reference tools for information on Jewish printed books and documents, ephemera, and graphic arts. Temple Emanu-El, New York, 1868. Harper's Weekly (Nov. 14, 1868). (ISJM) The Southeastern Chapter of the Society of Architectural Historians (SESAH)has presented its award for best book to Kathryn E. Holliday for Leopold Eidlitz: Architecture and Idealism in the Gilded Age (W.W. Norton, 2008; hardcover). The well-illustrated monograph is the first critical examination of the work of New York architect Leopold Eidlitz (1823-1908), America's first Jewish architect and a founding member of the American Institute of Architects, who was one of the titans of 19th-century American architecture but is mostly forgotten today, though his work was much admired in his time, and as Holliday argues, his organic approach to architecture laid the foundation for H.H. Richardson and his followers. For readers of this blog the book will of greatest interest for the first chapter, which traces Eidlitz's personal and professional roots to his birthplace Prague, and to Vienna where he trained before arriving in America at age 20 in 1843. Holliday establishes Eidlitz's Jewish origins, though once in America the architect neither confirmed nor denied his Jewish upbringing, and contemporaries and subsequent historians have been unsure of his past. While Eidlitz married his (non-Jewish)boss's daughter, he obviously maintained relations with New York's Jewish community. Holliday provides the most complete descriptions of his two synagogue projects - Shaary Teffila of 1846-48 (with Charles Otto Blesch)and the grand Temple Emanu-El of 1866-68, today Eidlitz's best known building, despite it demolition. As Holliday writes "It is ironic that Eidlitz, with his professional focus on Christian churches and his own desire to leave his Jewishness in the past, became most identified with a synagogue." (p 78). Fortunately, Holliday places her discussion of the synagogues in the context of his church designs, which make them seem both more common, and at the same time exceedingly original and even exotic. This book is an essential addition to the library of anyone interested in either 19th-century or American architecture. There are too few Eidlitz buildings surviving. In New York City the most impressive are St. George's Episcopal Church at Stuyvesant Square (1846-49) and the New York County (Tweed) Courthouse (1861-81). We are indebted to Prof. Holliday for bringing Eidlitz's rich body of work, and his writing on architecture, back to public and scholarly attention. Kathryn Holliday teaches architectural history and theory at the University of Texas at Arlington.